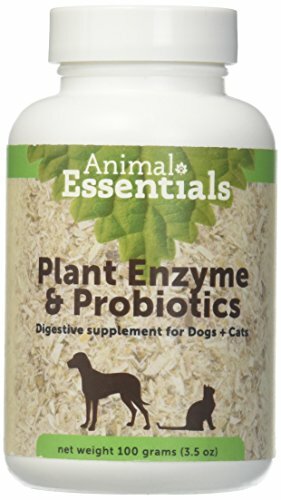 Animal Essentials' Plant Enzymes & Probiotics assists in the digestion and absorption of nutrients which are necessary to maintain your pet's good health. A small, very economical sprinkling each day will relieve extra burden placed on the digestive system by breaking down fats, carbohydrates, cellulose and protein. As your dog or cat's body ages less enzymes are produced and supplementation is necessary for optimum health. Digestive efficiency can also be reduced by excitement, anxiety or stress of any sort (travel, separation, working stress, etc.). To ensure optimum digestion and health we recommend the addition of this supplement to each meal.